Last week, Iranian blogger Potkin Azarmehr questioned the authenticity of reports that Iran had executed Majid Jamali Fashi, the 24-year-old Iranian accused of carrying out the assassination of Iranian nuclear scientist Massoud-Ali Mohammadi. 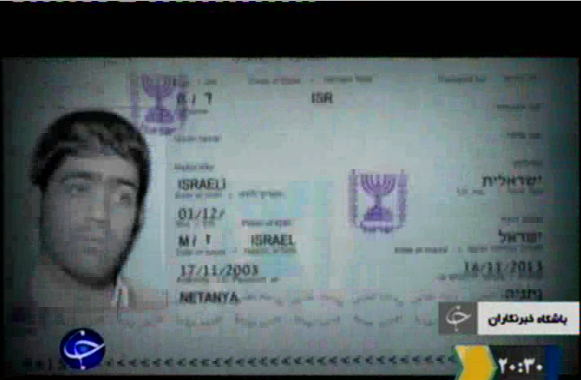 This morning, Potkin circulated a snapshot of an Israeli passport, showcased on Iranian TV, which authorities claim is evidence that Fashi was an Israeli agent. The passport Iranian television is claiming belonged to the alleged “Israeli spy” (see Gene’s story below) is a crude forgery copied directly from a facsimile of an Israeli passport on Wikipedia. Such was the ineptitude that the word “forgery” is in fact too generous – they made no effort to even change the details. The only difference is the new photo inexpertly pasted over the original (without even paying attention to the stamps). Details blacked out in the Wikipedia image are simply erased while visible details are left exactly as is.